Reference number for this case: Oct-54-Baudricourt. Thank you for including this reference number in any correspondence with me regarding this case. F. Diollez, in the ufology magazine Lumières Dans La Nuit #265-266 for July / August 1986, published a catalogue of the 1954 cases in the Vosges. He indicated that a case at Baudricourt, perhaps in October 1954, had just been discovered and was being investigated by J. Nicot. The witness was driving his truck on the Neufchateau road when he observed a UFO. He saw his headlights go out gradually near Baudricourt. Witnesses: Mr. M... - (truck driver at the time). Sources: Ongoing investigation by J. NICOT. 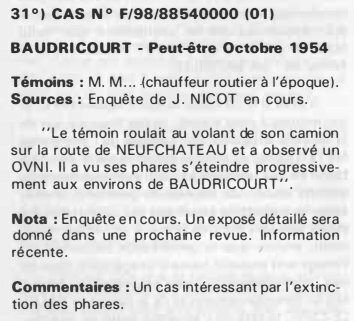 The witness was driving his truck on the NEUFCHATEAU road and observed a UFO. He saw his headlights go out gradually around BAUDRICOURT". Nota: Ongoing investigation. A detailed report will be given in a next issue. Recent information. Comments: An interesting case because of the headlights going off. A publication of an investigation report was to follow, but I found no trace of it. The information is obviously so poor that any explanation would be possible. [ld1] "Catalogue Rétroactif 1954 des cas vosgiens (3 - suite et fin)", catalogue by F. Diollez, in the ufology magazine Lumières Dans La Nuit (LDLN), France, #265-266, page 42, July / August 1986. 1.0 Patrick Gross December 6, 2018 First published.